Angleton, Texas is no stranger to special events that draw large crowds. And when portable toilets, wash stations and restroom trailers are needed to keep these events clean, safe and fun, there is Texas Waste, Co. From events like the annual Brazoria County Fair to businesses and construction sites, we provide only the most sanitary porta potty and hand wash station rentals. Texas Waste Co. is a business that’s locally know and proud of it! After all, if it weren’t for the loyal support of this great community, we wouldn’t be nearly as successful as we are. That’s why we pay our profits forward by employing, catering to and spending within the community. Whether you’re in need of a porta toilet rental, hand wash station rental or restroom trailer rental, you can count on Texas Waste, Co. for consistently clean and dependable service. In fact, our outstanding service and full-scale operation has made us a premier partner for many porta potty brokers who are looking for companies that own, service and rent quality porta toilets, restroom trailers and hand wash stations. With fair pricing and no hidden costs, contact Texas Waste Co. for your portable sanitation station requirements. We’ll provide professional, clean solutions for your business, construction site or special event and with a well stocked supply, we can handle same day or scheduled delivery and pickup. Angleton was founded in 1890 near the center of Brazoria County and named after the wife of the general manager of the Velasco Terminal Railway. Angleton plays host to the state’s largest county fair and is home to football legends like: Keith Toston, Quentin Jammer, Ahmar Hall, Gilbert Gardner, Ray Willis and Emmitt Thomas. If your looking for the best service and price for porta pots in Angleton, TX we have them. 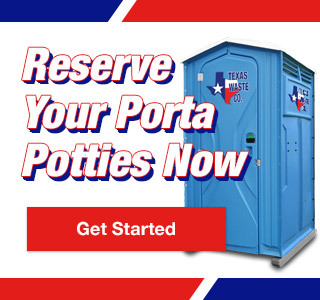 Angleton – Porta Potty Rentals Available Now!